Boomerang is located right on the blue flag awarded beach of Tsilivi in a wonderful environment with great views to the Ionian Sea. A large variety of fresh food, drinks and cocktails is waiting to accompany you to the ultimate sense of freedom you will feel while admiring the view to the Ionian Sea. Boomerang is located in the blue flag awarded beach of Tsilivi. With friendly staff, excellent food, large variety of cocktails and the best summer mood in the area, Boomerang is highly recommended for an unforgettable day at the beach suitable for the whole family. 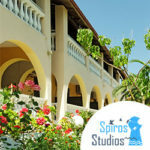 Book your accommodation in Tsilivi with Spiros studios and get a 10% discount on every meal you have at Boomerang.